Ask fellow campers about "Flat Creek Farms RV Resort" and nearby attractions. Stayed for one night. Called in advance and was given the last spot. He told me space #29, however when I got there somebody was in 29 and was staying a couple of days. I tried to call the owner of the park and he did not answer his phone. I called a few times and he still did not answer. I finally found another spot that somebody else was reserving. It's a nice park with clean bathrooms. You have to go through a residential neighborhood that was hard to get through in a 45' RV. The spaces are back to back and very close on the drivers side. Plenty of room on the passengers side. It was hard to get out of my spot because of how close I was to the RV next door the site was un-level had to use boards on one side of the RV. We camped at Flat Creek Farms RV Resort in a Motorhome. 5/6/18 Very tight for a 42' DP with toad. I had to unhook to pull in to my pull thru. Side by side pull thru is very tight but doable. Close to I35 and town. Be careful GPS wants to take you thru a residential street. Surrounded by corn fields very quite. Had to relevel as excessive slope not to bad though. Interior roads ok to navigate but had to unhook toad. one of the campers had a dish tailgater out about 20' from camper on corner lot into the road and host didn't ask him to move it out of road made it tougher. We camped at Flat Creek Farms RV Resort in a Motorhome. We had a confirmed site reserved and the day of the arrival, they moved us almost on the road. That meant someone else wanted our site and they gave it to them. Very poor business practice. Our site was a pull through, but with a rig our size, it is not good to do that since it was on the end in a curve of the road. Had to do some major jostling to get in in position. No sewer cap. Luckily we have pads to put under the levelers or we we would have pushed through the two inches of gravel into the mud. Won't stay here again. We camped at Flat Creek Farms RV Resort in a Travel Trailer. Our stay at Flat Creek Farm was by happenstance. All our first choice campgrounds, which were COE on Lake Waco, were closed due to flooding. We were able to snag a few nights at Flat Creek Farm but not as many as we wanted. The campgrounds that were not closed due to flooding were booked pretty solid from taking in all us displaced campers. Power was excellent, water pressure good, Verizon service was strong and the campground WiFi was so-so. Even with a WiFi booster it was tough to stay connected. A couple of times I had to give up and switch to my jetpack to complete what I was doing. Previous posts talk about the odd parking arrangements. We had one of these and it had the nose of our 5th wheel really close to the nose of our neighbor's 5th wheel. Luckily our neighbor was on a monthly plan and only there on weekend days, so we only saw them on the day of our arrival. Landscaping is well done and cared for. Sites are gravel and level with grassy space between neighbors on the camper door side. No fire pit, no grill and no table. And they are very protective of their grass, no mats are allowed. Really nothing is allowed on the grass. The office was not staffed the entire time of our three day stay. They were good at responding to the over-the-web registration and when I called the phone number I was given on my check-in email, they answered promptly. Not as affordable as a COE campground but very nice. I would stay here again if lower cost options are not available. We camped at Flat Creek Farms RV Resort in a Fifth Wheel. Don't miss the Waco Mammoth National Park. It has only been a National Park since July of 2015. Facilities are new and plans in place to add acreage and add/improve buildings. They are uncovering a Columbian Mammoth bull. This is a big boy, dwarfs a Wooly Mammoth. The park is mostly permanent resident, but to us that's not a problem if it's clean and this one is. The only downgrade is you have to do reservations via internet, never saw the owners or hosts, but no problems. Kind of odd setup with side by side pull this, but they generally work OK. Overall nice park. Moving to this area so probably will stay here again. We camped at Flat Creek Farms RV Resort in a Motorhome. Very nice, grounds reall keep up. At check in staff was very friendly and helpfull. Nice pull thru sites, good water pressure. Not far from Waco. I would stay here again. We camped at Flat Creek Farms RV Resort in a Motorhome. I liked this campground. Waco doesn't have a lot to choose from so this park fills a need. We had a level gravel back-in that was about 65' long with perhaps 30' between sites. Back ins are angled for easy in/out from the paved interior road. About half of their pull throughs are side-by-side which might put you pretty close to your neighbor depending on where RVs sit on the 70' shared pull through. You pick your site online which I like, but you pay the full balance when you reserve. The office was staffed during peak travel hours and signs tell you what to do if the office isn't staffed. There are few amenities -- no fire pits, no tables, grills, playground, fenced pet area, or cable TV. Park wifi didn't reach our site. But you do get to walk around the working sheep farm as others mentioned and I loved the quiet dark nights. Laundry worked fine for us. Another reviewer mentioned the very short 21,000# load zoned bridge on Greig Dr between I-35 & the park. All but the heaviest RVs will be well under that weight on any single axle or axle group. Verizon had a strong signal & most sites would be good for satellite. We'll visit again. We camped at Flat Creek Farms RV Resort in a Fifth Wheel. Very basic park in middle of field. Internet was not usable. Office staff comes and goes so not always someone there. Permanent resident sites were pretty rough. OK for an overnight stay. Thought it was over priced. We camped at Flat Creek Farms RV Resort in a Motorhome. Beautiful, immaculately maintained rural campground near Waco, Texas. Located in huge fields on a stream that provides a great breeze on hot days and some swimmin' holes. VERY quiet in the evenings except as noted below. SUPER nice hostess who was very helpful and friendly. Unfortunately the weekend host was not available when we tried to check in, making our Saturday check in difficult, but the hostess/manager returned our call after a couple of hours and got everything sorted out. Back in sites along the stream are beautiful and partly shaded - suitable for a longer stay and, in fact, most appeared to be taken by long termers. Why a 7? 1) Many of the sites are "shared" sites - 2 sets of hookups in a semi-level very dusty wide gravel space at each end of the site. Hookups "head to tail" but side by side so you're not lined up. We were quite close to our neighbor. 2) Our site was fairly near the entrance and after our neighbor pulled out it became a freeway - rather than driving down to the actual entrance people were driving through the vacant half of our site at literally all hours of the day and night, thus the noise I mentioned above. Final note: if you visit I recommend you not access the park from the south; there's a load rated bridge (21,000 lbs tandem axle) on Grieg Road. If you come in from the north on Grieg Road there's no issue. We camped at Flat Creek Farms RV Resort in a Motorhome. The new Waco Mammoth National Monument is absolutely fascinating. We rate it a Don't Miss. Good overnight stop in the Waco Area. Price reflects Passport America discount. Gravel sites seemed to be level throughout the park. Main road had some potholes that need attention. They had done a nice job in landscaping. Had a weak breaker on our site that was quickly fixed within an hour of reporting it. Would stay here again passing through. We camped at Flat Creek Farms RV Resort in a Fifth Wheel. One of its biggest perks: the grounds that surround this RV Park: open fields which are perfect for sunset photographs; the creek behind it, and the silence, only broken by the lovely calls of the wandering sheeps. The park is very clean all throughout. Two shower areas well lit and spacious, however guests have been smoking inside the bath area and when I wanted to use it, I had to open the window and door, and wait outside until the cigarette stench had left the building. I was not impressed with the laundry facility: though at first I found it welcoming, once I started using the washing machine I noticed it did not fill up with enough water. Another park guest was "helping" the machine with a 5-gallon bucket of water, lifting, and dumping the water inside. Then when it was time to use the dryer, I had to pay for two rounds in order to get an "almost dry" load of clothes. Other residents appear to be long-time residents, good folks working nearby: all fantastic people who help enjoy the experience of Flat Creek a whole lot more. Downside: no shade, no trees. We camped at Flat Creek Farms RV Resort in a Travel Trailer. If you are visiting Waco for business, this park is for you: it is perfectly located within a 5 minute drive from Downtown. A wonderful place to relax and watch the sunset. This is quite possibly the best campground I've ever stayed at! It is very clean and well kept. While there are no playgrounds, there is plenty to do. It is on a huge farm with hundreds of gorgeous acreage to ride bikes around, walk, etc. There is a beautiful creek that you can swim and fish in. There are two pond/lakes to swim and fish in. There are sheep and sheep dogs! There is also a beautiful building that holds the office, bathroom, showers, and a place to cook and eat for large parties. There is a fire pit there and a big front porch with huge comfortable rocking chairs. You really feel very at home here. I can't say enough good things about it. The ONLY issue I noticed were some residents that had some sort of domestic dispute which had to be settled with a police officer. I hate to even say that because it puts a bad light on this park. But I believe in completely honest reviews. I would definitely stay here again. We camped at Flat Creek Farms RV Resort in a Travel Trailer. We have mixed feelings about this little park. Easy access from IH-35 just to the east. The first impressions were good. Big area, beautiful rock entry gate, lots of green grass and new trees and shrubs. Sites are packed gravel, nice and wide, easy in and out. Very quiet no highway noise. CONS: No one on sight to check you in, just a sign with a "for information call #." We left payment in drop box after picking a site. Most folks here were long term workers in the area. There were a couple FEMA trailers with the AC's running, but no one around. No pool, no Wi-FI, no cable TV and weak cell service for AT&T. There are NO street lights or lighting around the campground. After dark, you need a flashlight to walk around. Flat Creek will flood so be careful if flash flooding is forecasted. We came back from dinner with friends to find the main gate closed and we had been not give a code. The info line was answered and we got in with out a problem. Lots of potential for this little gem, but the owners need to step up and be on site. Too expensive for what you get. Doubtful we will return. 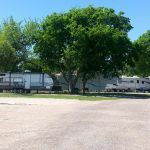 We camped at Flat Creek Farms RV Resort in a Fifth Wheel. This is a charming little park. It is easy access, level, concrete sites with what appears to be new equipment. The check-in procedure is unusual, but was not a problem. There are a lot of long-term residents. They were all friendly and helpful in directing us to a lake for dog swimming. Avoid the Creek, we were told it is very snaky. It is worth the price, a very quiet, perfectly adequate park. We would stay here again. We camped at Flat Creek Farms RV Resort in a Motorhome. This is a strange little campground. It has only been opened up for 6 months. It is in excellent maintenance and the person running this campground will bend over backwards to help you in all ways. It is hard to describe in that this is not a typcial campground. It is very clean and has good restrooms. Additionally it has free laundry machines for your use. Additionally there is a little house on site which is always open and has rocking chairs on the porch. You can use the house and it has 3 sitting areas and another 2 bathrooms in it. There is a large herd of sheep guarded by 2 big dogs right next to the campground and you can go in and see the sheep or wonder out to the several lakes. There are peacocks and other birds kept near the house in pens which are interesting to watch. There a number of antique trucks and cars you can wonder around and look at also. The campground is settled between a large corn field and a creek. It feels like you are in the middle of farm country but you are only 5-10 minutes from all restaurants and shopping. We stayed here 3 days because our truck was broken down and to help us out the owner just lent us his car. There are a number of longer term residents here who keep there area spotless and are very friendly. It is very difficult to see the sign for the park and you can easily miss it. It is a gated campground and the gate is set up I think to close when it gets dark. We camped at Flat Creek Farms RV Resort in a Fifth Wheel. Are you affiliated with Flat Creek Farms RV Resort ?